Having recently been a witness to the miracle of birth (my first child was born November 1st), I feel like I have a brand new perspective on Christmas. Birth is, in and of itself, an amazing miracle. Every aspect from conception through delivery holds mystery and inspires amazement! Just one example that blew my mind: I came across an article while my wife was pregnant about “microbes”: little microscopic organisms that live in all of us and scientists are now finding out that these little creatures—though there are some bad ones out there—actually seem to provide a whole host of helps to their human hosts (i.e. helping to stave off cancers and other diseases, etc). And here’s the flabbergastingly amazing part: They’ve found that just before birth, a whole bunch of the mother’s helpful microbes make their way down to the birth canal to literally paint the baby on his/her way out so that they can have all that help from the very start. 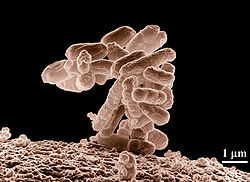 Now, who tells all those microbes where to go and that the birth is coming so it’s time get a move on? That, my friends, is a miracle! And we have a God who does the miraculous. Now consider the miracle that God was once painted with some helpful microbes, too. Wow! LINK to USA Today article.